A descriptive list of every hike on this site, in alphabetical order! Lake Alpine (dayhike on Highway 4) : There's a nice trail around the lake itself--and there are quite a few dayhikers on it. But do take the time to take the side trip up to Inspiration Point--which has great views over the lake and beyond. Enjoy the rock gardens that have been created by other hikers on top of the point. And you can continue out this direction to Duck Lake, as well, with its meadow and granite. The trip around the lake is quite easy, with no real climbing at all, and it's only about two miles. the steep but very short climb up to Inspiration point is only about 1/4 of a mile. None of this requires anything but a quart of water and a camera to capture the views. Andesite Peak (dayhike on Highway 80): this is the smaller peak just southwest from Castle Peak. You park at the Castle Peak trailhead and you climb it by following a clear trail that ascend the ridge to the soutwest. 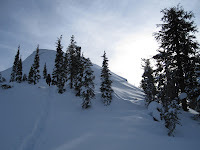 Once you get to the saddle between Castle and Andesite Peaks, you turn left towards the southeast to the top of Andesite Peak. We did it in snowshoes in May, when it was too snowy to get to Castle Peak, and had a great time. That's a view of Andesite Peak from a few hundred yards below the summit on that hike. And on top we met a couple of guys who had carried their skis up and were soon racing down the slope towards the trailhead. Bassi Falls (dayhike off the Ice House Reservoir road on Highway 50):This one is almost too easy. From the main road across from the Azalea Campground on Union Valley Reservoir, you can take a rough dirt road about two miles to the trailhead, and then hike another half mile to the falls. The road gets a little hairy right near the top, but even if you chicken out on the dirt road (we did, about 200 yards from the end!) this is still worth hiking--even from the bottom of the road! In June of 2012, when the snowopack was in full melt, this was a roaring cataract, as you can see in the photo at left. Boulder Lake (out of the Clark Fork trailhead, Clark Fork Road off Highway 108): The first 2.3 miles of this trail are a gentle stroll along the Clark Fork of the Stanislaus River, not much in the way of views, but the fishing can be nice. And then you reach the junction. If you boulder hop across the creek, you'll continue up the Clark Fork, and eventually get up to St. Mary's Pass and the Pacific Crest Trail. But our trail turns left, and begins to climb quite steeply and steadily for 1.7 miles up to 8,000 feet. And all of this climb is on a south facing slope, so on a warm day you can expect it to get hot. There should be water in the creek that you cross in the small meadow about one mile up from the junction. As you climb, the views get better. That's St. Mary's Pass, and Sonora Peak in the photo above right, taken just a short distance from the top of the climb to the lake. And while the lake itself is quite small, and the camping sites are very well-used, it's still a nice place to stay. And you can go on from here, leaving the lake behind and climbing up to the Pacific Crest Trail here, as well. In the middle of the summer this is a busy place, because Boulder Lake is only four miles from the trailhead, and it's a great first night spot if you are going to spend the next couple of days working your way around the Carson Iceberg Wilderness high country. Boundary Lake and Kibbie Ridge (Yosemite National Park, permits from Groveland Ranger Station of the Tuolumne National Forest, Highway 120) : When we did this trip, it was a substitution for the Grand Canyon of the Tuolumne. We got a late start, and it was quite a hike to get over Kibbie Ridge and into the Cherry Creek drainage. This starts with a steep climb for a mile or so, and then continues with more gently uphill almost the full five or six miles of Kibbie Ridge. (Don't miss the one notable viewpoint on the ridge just west of the trail, about four miles in, with its view of Cherry Lake--it's just about the only good view for miles.) When we hiked it there were scores of deadfall trees to climb over or around, but recent reports indicate that those have been cleaned up. There are a few meager water sources on the way, but six miles in you arrive at Sachse Spring amid glorious wildflowers. The spring itself includes a pipe with a delicious stream of clean, cold water and a well-established campsite. We chose to keep going because it also included plenty of mosquitoes. From here the trail heads up over dramatic Styx Pass. You can head cross country to the right to visit Many Island Lake, or climb Mercur Peak on the left for spectacular views over the whole Cherry Creek Drainage. You can easily climb Mt. Mercur above Styx Pass by heading west just before the pass and then climbing the southwest face of Mt. Mercur. It has astonishing views in all directions--as you can see in the photo below right. That's a lot of granite! It's a very steep mile or so down from the pass into the Emigrant Wilderness and Cherry Creek. We camped here the first night in a nice grove of trees. In the spring this can be roaring, but later in the summer it turns into a series of large pools with very little current, and not that many fish. Upstream from here is Huckleberry Lake and adventures. But our trail took us back along the trail down from Styx Pass about 1/3 of a mile, where we found a large cairn indicating the trail up to Boundary Lake. This is called a use trail, but it is marked on the Yosemite maps. It can be a bit hard to follow through the granite slabs at times, but that just gives you a chance to catch your breath as you climb above Cherry Creek. . It's a very steep climb, but after 1.5 miles or so, you arrive at the top of the ridge and have an easy stroll down past the sign marking Yosemite National Park into Boundary Lake. This is very isolated and quiet territory, and we met only one other person on this hike. He told us of a mother bear and cub that had visited the lake the night before. Sadly, they made no appearance when we were there. Campsites here are on the southern side of the lake, and we used this as a base camp for some exploring in this region. There are no fish in any of these lakes, by the way, so we plenty of time to explore! We climbed the easy right south of the campsite and were rewarded with views of the Bartlett Creek drainage: a series of small lakes strung along the course of Bartlett Creek. We followed the creek to four small lakes, then turned left and followed the tributary creek back up to Little Bear Lake. This is a shallow lake with lots of granite Islands. From here we hiked along the southwest shore until we could see an easy way up to the top of the ridge...which we followed all the way to the top of dome at the end. That's the view from the top in the photo below right. After three lovely days of seeing nobody, we finally brought ourselves to climb back over Kibbie Ridge and head home, much happier and saner then when we left. But that long slog over Kibbie Ridge back to the trailhead still took some time. Don't take this hike if you want instant gratification and spectacular views. Those only come later. But if you want solitude and beauty, this one's a keeper. The photo on the homepage of our website is Boundary Lake as the sun was going down. We sat on the warm granite together and watched the show for at least an hour and a half. It's 24 miles to Boundary Lake and back. And it would be easy to extend this to Spotted Fawn Lake and beyond. You can see more of this area in the photos on Picasa. Boyden Cave (dayhike. Parking and trailhead where the road to Cedar Grove first meets the Kings River in Kings Canyon) : This is an easy walk that's prefect to take on a hot summer day when you already have a campsite in Cedar Grove. The Canyon at this point is deep and often baking hot, and this trip through the Cave will cool your heels in a wonderful way. Plus, it's worth getting out of the car at this point just to appreciate the scenery at the bottom of this narrow point in the gorge. Boyden Cave is a privately operated attraction, but we found it well organized and friendly. If you are interested, they also offer more active adventures, including rappelling, but we just took the tour. The photo at right is only one of the many notable sights in the cave. 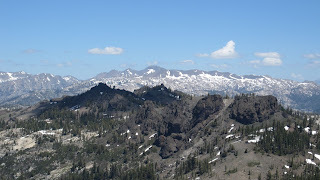 BrokeOff Mountain (dayhike in Lassen National Park) --This is the best hike in this wonderful park, for our money. It's also the last one to open up each year, as the north side of the ridge stays snowy into July some years. 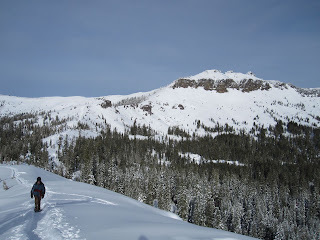 But it takes you through lovely varied terrain up to the second highest summit in the park, with views to match, and fewer than 10% of the people on Lassen Peak itself. The trail starts just past the visitors center at Mineral on the south end of the park road, and climbs up the ridge through a few shallow creeks until you can follow the small creek that drains forest lake. About 1.5 miles in the trail crosses that creek and then leads up the steep southeast face of Brokeoff. There can be snow here well into July. After a couple fo gentle switchbacks, it eventually crossed around to the soutwest side of the mountain at about 8400 feet. From there the trail goes straight up the ridge for 1/4 of a mile, and then follows a very long single switchback across this face. After the switchback you follow the ridge to the peak. There are great views of Lassen Peak and the surrounding area, and you can see how this was all part of a much larger volcano that exploded some 10,000 years ago. About 7-8 miles. Bumpass Hell (dayhike in Lassen National Park)--the premier bubbling hot spot in Lassen, this is a three-mile trail that leads you into Hell, literally. Be prepared for crowds, but this one is worth the effort. It has massive bubbling pots, pools and stinky steam. The trail works its way along a steep granite ridge for the first mile, then descends down into ...well, Hell. Once there, you can smell the fire and brimstone, and walk on boardwalks to protect your feet. Please stay on these platforms. The original Mr. Bumpass actually fell into one of these boiling mud pots, and was severly injured. But where else can you allow your young children to say "hell" in polite conversation? Camp Lake and Bear Lake (Highway 108) From the trail head at Crabtree Cabin, behind Dodge Ridge, this is a nice five mile hike that is easy to get to, easy to hike, and has both fine fishing and lovely scenery! The downside? Yeah, you will probably be joined by more than a few people, especially on the weekends. Start at the Crabtree Cabin trailhead and cross the bridge, following the trail as it stays level for about a mile, then it turns left and climbs up out of the creek drainage for a half-mile or so through a shady forest. At the junction, you keep left and walk through a narrow canyon to Camp Lake. Whatever you do, don't miss the one really nice view on this trail. When you get to junction at the top of the first ridge, walk 100 yards or so down the trail to Grouse Lake...and the whole Emigrant Basin opens up in front of you. There is no camping allowed at Camp Lake (go figure!) but you can always keep going--there are campsites at Bear L:ake or along the creek above Bear Lake (or go cross country following the cairns and plastic ribbons up the ridge to Granite Lake. Or follow the creek up to Y Meadow Dam Lake. Or...this is a great place to explore!) under 10 miles. rt. Castle Peak (dayhike on Highway 80): Our favorite day hike in this area takes you to a grand view overlooking Donner Pass and the whole northern Tahoe region. The trail is pretty straightforward--you head northwest from the Castle Peak trailhead to the top of the ridge, then turn northeast to climb up along ridge up to the peak. There are views the whole way, and plenty of reasons to stop and catch your breath as you climb. The last little bit to the top requires some scrambling up the backside,, but only if you insist upon standing on the very top. We did, and it seemed worth it. And we are not the most adventurous of mountaineers. M hates falling! The views here of the whole Tahoe area are great ( you can't see the lake, but you can sure see a lot of other stuff) but you are also close enough that you hear the traffic on Highway 80. Still, this one is well worth doing. 4 miles rt. Cathedral Lakes (Tuolumne Meadows, Yosemite National Park): This is another really attractive destination that really only suffers from too much popularity. It's a lovely 3-4 mile hike from Tuolumne Meadows, and along the way you can muse about how P managed to climb up Cathedral Peak from this trail thirty-five years ago. When he looks at it now, he certainly has second thoughts. Perhaps that's maturity, perhaps it's just age. The trail leads up the ridge from Cathedral Lakes Trailhead at Tuolumne Meadows (be sure to put ALL edible or aromatic things in bear boxes here, because if the bears don't get you, the rangers will!) And it's pretty straightforward climb up about a half-mile to a plateau, and a mile of level hiking, repeat to get to the next level, and you'll see the lakes. Chilnualna Falls and beyond (South entrance, Yosemite National Park): For people staying at Wawona and the southeast entrance station, this is the best hike in the area. But while most people do this as a day hike, it is also possible to lug your pack up to the top of the falls, and then you have a wonderful and solitary region to explore. It's a steep hike, but there are some really nice views of Wawone Dome and its ridge along the way. First you pass the lower falls, which are the destination for most of the day hikers. From there the trail climbs pretty steadily through switchbacks, occasionally opening up to show vistas of the ridge opposite the creek, and even a few views of the upper falls themselves. In the summer, this can be hard, hot work. Early in the year this can be a tricky hike above the falls, as the creek can be roaring and the trail requires a crossing. If in doubt, do the smart thing and sit back and enjoy the view. And leave it at that. 9 miles to the top of the falls and back. Clark Fork and beyond: (Highway 108)The Clark Fork Trailhead off Highway 108 does a great job of getting you into the mountains quickly--and the trails here are not so crowded. The very nice people at the Summit Ranger station are helpful, and it's easy to get the free permits they issue. In short--this is a great fallback destionation for lots of reasons! The trail up the Clark Fork itself is another good hike for early in the season, or early in your hiking career. It's just about four miles to the waterfall, and only one of those miles is steep. The first 2.3 miles of this trail are a gentle stroll along the Clark Fork of the Stanislaus River, not much in the way of views, but the fishing can be nice. Then you come to a junction, keep right, and hop the boulders across the creek. (there are some decent trout here, if you need a reason to stop.) The trail immediately climbs steeply for half a mile, and at the top you get the view of the waterfall. From there you can have the rest of the canyon to yourselves. There is nice fishing for brook trout in the creek, and enough use trails to wander around for a day up to Clark Fork Meadow. We spent a day wandering around here, exploring and soaking up the quiet and isolation. It's beautiful, peaceful, and easy. The only real downside to this hike is that there are range cows here, with cowbells on their necks. So your peaceful evening can seem a bit like a downhill ski race in Switzerland....clang, clang, clang! The waterfall at right is the highlight of the hike...unless you count the isolation. We do. 10 miles, depending on where you stop to sleep. Clark Range Vista. (dayhike, Highway 120 near Crane Flat in Yosemite National Park) If you are staying in the Crane Flat campground, you can always hike the short (not quite 4 mile) trail along an old road that leads you to a dead end, where you can, with a little work, see the Clark Range. The walk itself is easy, but beware. The vista itself isn't much, unless you take the time and trouble to bushwhack up the ridge at the end of the trail to get to where you can actually see above the trees. Then you can see the vista in the photo at left...which was taken in the middle of winter after a snowshoe trek. And in those conditions, this one is a real treat! Cloud’s Rest: (Off Tioga Road in Yosemite National Park) This is our favorite longer dayhike in Yosemite. In our opinion it offers better scenery, higher elevation, and fewer people than Half Dome. You start at the Olmstead Point/Tenaya Lake trailhead, and cross Tenaya Cree, which early in the season can be exciting: cold and thigh deep. From there you climb up to the ridge on the way to the Sunrise High Sierra Camp. But at the top of the ridge you turn right, follow the east side of the ridge south, and then climb up the final ascent to Cloud's Rest. The last 300 yards to the summit is impressive, as you can see that the granite is a sheer wall that falls off nearly vertically into Tenaya Canyon on your right. While it is not dangerous, it does focus your mind rather splendidly on what your legs are doing! This is also well worth a side trip if you are hiking from Cathedral Lakes or Sunrise down to Yosemite Valley. Cinder Cone (dayhike in Lassen National Park)--for those who love walking uphill and sliding back down with every step, this is a dream hike. This colorful volcanic wasteland is only accessible from the Northeast corner of the park, so it's quite a drive from Manzanita Lake--and even longer from the southern side of the park. After you drive to the parking area at Butte lake, you've got about a mile and a half or more to hike on level ground to the base of Cinder Cone. Then the fun starts. This is exactly the kind of cinders that people use in their xeriscape gardens, and here it is piled up hundreds of feet high. The trail climbs the northwest side of the cone, with views of tree-covered Prospect Peak. once on top, the view inside the cone is a collage of red, black, and brown lava, and you can see over the Painted Dunes and Lava Beds southeast of the Cinder Cone. This is a good hike to say you have done. But we're not sure we'd do it twice. Colby Lake:(Out of Cedar Grove in Kings Canyon National Park) Years ago, P took this trip with a friend in September after just about everyone had gone back to school--and we didn't see anyone for days. We started out by driving from the Bay Area before the crack of dawn, and arriving at Road's End in Kings Canyon around 11 a.m. We hit the Bubbs Creek trail hard, and our plan was to make it all the way over Avalanche Pass that first day, but we crashed and burned on that attempt. When we found a flat space and water where the trail crosses Phinx Creek, we collapsed and camped. 6 miles and 5000 feet of elevation gain was enough for one day. Especially since we were carrying packs that weighed around 45 pounds. The next day we kept hiking, amused that Avalanche pass is a nearly perfect parabola--you keep thinking you are getting near the top, only to see the crest receding away a bit more gently each time. Once over Avalanche Pass it's an easy hike down into the Roaring River Valley. There is a ranger station there, and we camped nearby and caught brown trout out of the river. The next day is one of the greatest hikes I've ever done--up the canyon towards Colby Lake. The views of the High Sierra, with vast golden meadows and towering peaks, were stunning. On the eastern side of the valley, the knife-like ridge of the Whaleback is astonishing, and the whole hike just kept getting better. We ascended the chute between the Whaleback and Milestone Mountain, and camped along a creek that had lots of little golden/rainbow hybrid trout, and were delighted. Can you tell this was a fishing trip? The next day was a piece of cake, wandering up to Colby Lake, where we camped and caught rainbow/golden trout hybrids that were brilliantly red. In fact, we caught so many that we both threw them all back--thinking the other guy was keeping some. It was a frantic 45 minutes of fishing before dark to catch enough for dinner. (In those days, our dinners were Knorr instant sauce mix, trout, and instant rice, all cooked over an open fire!) P did catch a 13 inch golden trout at the outlet of Colby Lake...and will always remember this trip as a great adventure. But time was passing, and we each needed to get back to our lives. We packed up and hiked back down to camp again at the Roaring River ragner station, where it froze at night. Our hi-tech dacron-II bags and tube tent were not really up to the challenge. And so the next day we easily made it up over Avalanche Pass and back to Road's End. The whole trip was about 35-40 miles, depending on where you stop. And yes, he'd love to do it again! Cora Lakes, Isberg Pass and the Ansel Adams Wilderness: (Out of Bass Lake near Mariposa at the southern side of Yosemite National Park) The hardest part of this trip is the drive to the trailhead, which is more than an hour from Bass Lake on Beasore Road. The trail takes you past Cora Lakes and then up to Sadler Lake, Isberg Pass, and into the very southern sections of Yosemite. And if you take Post Peak Pass on the return trip, you get views of most of southern Yosemite on one side, and all of the southern High Sierra on the other side. It all begins at the Granite Creek Trailhead, and we actually parked at teh ranger station at Fernandez Trailhead so that we could shorten the loop on the way home. We just hiked the mile and a half back to the campground, after dinner. The trail leaves Granite Creek amid the usual confusion of old logging roads and horse trails, but soon you are climbing up to the Niche, and enjoying some nice views along the way. Once over that first climb, the trail winds its way through the granite of the Niche and then continues, very genlty and mainly downhill to a series of junctions. With a map and some concentration, you can figure out which trail actually leads to Cora Lakes...and you are one your way. Cora Lakes are pleasant, but lack the scenery of most of the other lakes on this trip, so we kept right on going, through lovely meadows and along the upper reaches of Granite Creek. This part of the trail is wonderful as it follows the creek for a few miles. When we stopped for lunch, P couldn't resist getting out his fly rod and catching a few lively trout from a neaby rock. The trail continues along this stream at a gentle climb, passing the junction to Joe Crane Lake, and then climbs steeply for the last mile up to Sadler Lake. We camped here at a large and developed horse packing site, and kept a low profile. The views of the Isberg Pass area are wonderful, and P caught a few fish before dinner. That's Sadler lake in the photo far right. The next day we were up early, and off on the trail over Isberg Pass. This is some of the best hiking in the Sierra, with amazing views in every direction, secret lakes behind every rise, and a trail that never ceases to delight you. We climbed up past the Isberg Lake, snapping photos like crazy, and then cut across the long switchback to hike cross country up to Isberg Pass. And there was all of southern Yosemite National Park for us to see! That's a shot over Upper Isberg Lake and out to the southern Sierra at left...and it doesn't really capture how beautiful it all was. But the north side of Isberg Pass is no fun at all. A steady diet of rough, rocky trail that picks its way down through a maze of broken rock and cliffs, the route delivers you to the bottom of the pass feeling as if you have been through the wringer. Sure, there were some nice views, but this trail has you looking at your feet the whole time. No fun. Once down, however, you are in the upper reaches of the Merced Canyon, on a series of bench meadows that are delightful. We decided to camp off trail at Lake 10005, which lies with its smaller sister just at the foot of the ridge. A lovely spot, with nice camping on the wooded area above the lake, and a beach and good trout fishing as well. That's the scene at sunset from our campsite, at left. We were dreading the climb back up over Post Peak Pass the next day, but our worries were groundless. It was a steady climb up a perfectly reasonable trail, and it took us up to our favorite pass in the High Sierra. Post Peak Pass is a long traverse along the ridge at the head of Merced Canyon, and the views in all directions were simply amazing. At one point we just stopped and sat down to enjoy the view for about twenty minutes. Sadly, you have to keep going, and the descent down from Post Peak Pass wasn't a lot better than the one on Isberg Pass. That's a photo of Banner, Ritter, and the Minarets behind Ward and Sadler lakes at right. From here we hiked down to the junction with the Fernandez Trail, (don't look for the junction with Timber Creek, as that trail is no longer maintained--and we never saw it.) And then we climbed back to the North to go up to Rutherfor Lake. Make sure you climb the ridge on the southeast corner of the lake, as if offers a wonderful view of the whole area you've just hiked, s well as Anne Lake below. This is a great spot, although from here on we saw more people and horses than we expected. This trail clearly gets more traffic than the Isberg Pass area. On the following day we hiked down hill along the Fernandez Trail, passing Lillian Lake (lots of campers here) the tiny string of Stanford Lakes (a bit marshy and buggy) and then up and over the ridge to Vandeburg Lake. While not the most idyllic of the lakes we saw on this trip, this made for an easy hike out the next day, and we were back in our car before noon. And that meant that we were back home by dark...and ready for a new adventure. This is some of the greatest country in the Sierra, and the views will stay with you a lifetime. The total trip, from Granite Creek Trailhead to Isberg Pass, over into Lake 10005 and then back down through Post Peak Pass and the lakes above is about forty miles, total. We did it easily in five days. Here's the blog: The Full Report on our last trip... and there are a few more entries about our adventures here: You'll never walk alone...; Cowboys on the Trail, and The Fish are always bigger..
Courtwright Reservoir to Red Mountain Basin: (Courtwright Reservoir trailhead, above Clovis in the John Muir Wilderness) This is a longer hike than most on this site--about thirty five miles. But it takes you through some of the best country in the Sierra, and not many other people. Add some great fishing, and this is one area we'd love to visit again. It all begins at Courtwright Dam. At over 8000 feet, this is a nice lift to the first day's hike. From there it's an easy 7-8 miles to Post Corral Meadows, where you can find quite a few campsites--and sometimes quite a few people. Since those miles were relatively easy, without a lot of up and down, we chose to keep going, and camped about 4 miles further along the trail, near the Kings River. Lovely deep pools, as you can see below, but the fishing wasn't great. And from there it is a brutally steep climb up to the Devil's Punchbowl. The only good news is that once you get past the first three miles or so, the trail begins to level off in a series of beautiful meadows that seem to drop right off the hill behind you. Lovely stuff--lakes of green grass amid the granite--that make perfect places to stop and catch your breath. er--admire the view. And when you get over the pass to the Devil's Punchbowl, the rewards are definitely worth it. As M said when she arrived: "Wow, this is the real deal!" The Punchbowl is a great camp for further exploration of the dismally named Disappointment and Hell-For-Sure Lakes. The fishing is very good for rainbows and brookies, and the views of the basin continually delighted us. To avoid mosquitoes early in the season, we camped on the ridge west of the lake, and enjoyed the best views to boot. It's a vertical drop about 500 feet down the lakes you can see below you. On the way back, you can cross the basin and head straight down past Fleming Lake to Post Corral. If you camp there, the next day is an easy hike back out. And if you like this trip, think about adding on the one below, which connects at a trail junction near Fleming Lake. Courtwright Reservoir/Red Mountain Basin to Lower Indian Lake: (Courtwright Reservoir trailhead, above Clovis in the John Muir Wilderness)This is a shorter hike, as it is only about five miles from Post Corral Meadows up to Rae Lake, and by then you are practically at Lower Indian. The first seven miles or so is the same as the hike above. The climb here up from Post Corral Meadows to Rae Lake is also steep, but not quite as bad as the climb up the backside to the Punchbowl. And once at Rae Lake, we think it's better to just keep going to Lower Indian--one of the most spectacular lakes in the Sierra, from our point of view. Huge open vistas allow you to see for miles, and the lake opens up to the sky in a way that just makes you want to open your arms and embrace it all. Fishing, at least early in the season, can be sensational. Although those early season trips have their drawbacks. P caught five nice fish from 10-13 inches in about twenty minutes here one day, and then ran racing back down the trail to the tent because the skeeters were SO BAD. It should be noted that the pass in the distance on this photo is called Mosquito Pass. Still...nice fishing. 30 miles rt. Crabtree Cabin to Lower Bucks Lake: (Highway 108 behind Pinecrest Lake)This is one of our favorite all time hikes---starting out at the same trailhead as Bear Lake and heading deep into the heart of the Emigrant Wilderness. But instead of heading north to Bear Lake, this trail veers east at the junction, and then plunges down into Lily Creek. Early in the season, this can be a raging icy torrent, but later on it won't get your ankles wet. And then the trail climbs right back up again to a narrow lake choked with lily pads. Then back down into Piute Creek, and up again to Piute Lake. And it does this a couple of times as it works across Gem (photo at left, which is where we camped the first night), Jewelry and Deer Lakes. There are regular sources of water on this trail, but beware that later in the year the creeks can dry up, and the one lake full of lilypads is not good for your filter! There is good fishing in Deer Lake, and the trail never gets too steep for too long. Every time you think you might need water, another lake comes into view. And the scenery is really great--a kind of mini-Yosemite, with the same kinds of granite features you'll further south in the national park, but on a smaller scale. Once you get past Deer Lake the trail slowly (and then steeply) drops down into Bucks Lakes, and you have a wonderful selection of campsites and fishing spots. Bucks Lakes sit in a stunning valley walled with white granite--and have lots of nice fish to catch. That's Lower Bucks Lake in the photo at right. You can come back out the way you came in, or use this as a starting point to explore more of the Emigrant Wilderness, including the two trips below. Crabtree Cabin to Pingree, Yellowhammer, and points beyond: (Highway 108) If you really want an adventure in this region, follow the trail up past Grouse Lake into Louse Canyon, and then follow a series of "ducked" routes to some of the most remote and beautiful lakes in the Sierra. Just make sure you know how to read a map, and that you understand exactly what ducks are--an unofficial guide that might get you to where you want to go. Or might not. You start at the same trailhead as Bear Lake, but this time you go right at the top of the first right, takin the trail down the dusty volcanic slopes to Grouse Lake.This isn't a great lake for camping, as it is choked with lily pads in most places--but as the photo at right shows, it can be beautiful at sunset. Our route turned right off the main trail as we were reaching the bottom of Cherry Creek Canyon. From there a clear use trail led us down Louse Canyon, and then to cross Cherry Creek. This part was confusing, because the trail crosses the creek at a huge rock cairn, but the next one is hard to find. Continue down the creek almost due South to pick up the line of ducks. You can see where this trail has to go to get up the cliff ahead of you--but it actually starts farther down the canyon that you expect. The climb to Resasco Lake is very steep and tortuous, but once you find the marked route, you can't really get lost, because there is no other option in this area. That's M in the photo above left, climbing through the talus. You can see at least two ducks in the photo. We spent the first night at Resasco Lake, and then carried on to the east across the ridge and down into the large granite valley towards Pingree Lake. At the bottom of this valley is a series of large cairns that mark four routes coming together. We first hiked up to Pingree Lake, then back down to take the southernmost route around to Big Lake, and on to the odd, narrow Yellowhammer Lake. This is amazing country, and the stretch of "trail" between Pingree and Big Lake traverses the single biggest expanse of granite we've ever hiked, and we'd do it again in a heartbeat. There are no ducks or markings of any kind. You just have to believe that you should keep going ahead. That's M in the middle of it in the photo below. We ended the day up at tiny but wonderful Five Acre Lake, which sits in a small bowl at the base of a granite cliff. Simply stunning. That's it below right. And from Five Acre Lake there is a nice but not very well marked cross country route that will take you up to Red Can Lake and then Leighton and Karl's Lakes. (There are no fish in these lakes, but there are in both Red Can and Five Acre.) We simply read the map and worked out way up the creek towards Red Can Lake, carefully looking for a way to get up over the granite. Once we were up on top, we realized there is also a ducked route that looks perfectly doable following the east side of the creek that exits Leighton Lake. We camped at Karl's Lake, and took advantage of the surrounding granite to explore Kole Lake and the views off the ridge south of Leighton Lake over the Cherry Canyon and Northern Yosemite. That's one of the photos at right. From Karl's Lake, there is an obvious use trail that takes you up back up over the small ridge to Wood Lake, and that trail connects back to Louse Canyon and the trailhead at Crabtree Cabin. This is nice hiking, with lots of granite above, below, and underfoot. Crabtree Cabin to Wood Lake and Beyond: (Highway 108)If you like to explore beyond the established trails, then this is another option for you. You start at the same trailhead as the hike above. Again, Grouse Lake isn't a great lake for camping, as it is choked with lily pads in most places. The best spots are on the southern shore, where a granite bench gives you access to the only part of the lake that doesn't have many lilly pads. The ridge behind here eventually leads to Chain Lakes. If you are interested in reaching these, you can work through the granite southwest of Grouse Lake cross country. But once you get beyond Grouse Lake, it is heaven--a series of amazing climbs and trails that lead first to Cherry Creek, then to Wood Lake. Of course, you'll have to climb the stairway to heaven, a carefully crafted trail between Grouse Lake and Groundhog Meadow...seen in the photo at left. And from Wood Lake you can really go cross-country! It's an easy hike to Karl's Lake (there is a use trail, but we found our way without needing it at all--photo is at right) and then you can just lake hop for days, through Leighton Lake and beyond. Wood Lake has excellent fishing, and the whole region just begs to be explored more...You can even extend this trip by heading north out of Wood Lake, and connecting up to the trail at Bucks Lake...and return via the route above. 20 miles rt to Wood Lake...and then explore! Mt. Dana:(Tioga Pass Road in Yosemite National Park) This is one for peak baggers--because the hike itself is a lot like the climb up to Mt. Lassen. It's straight up the side of the mountain, working through the red/black volcanic rock. There is a plateau about half-way up that looks very much like the moon, and there are even semi-tame marmots at the top. No, we don't suggest feeding them. But they have other ideas. There is no real trail here once you get up on the mountain, but it's hard to get lost as long as you keep going upwards. See the ridge in the photo at right? That's more or less where you hike. This is one of the tallest peaks in Yosemite, and so you can see almost all of the park from here, as well as the blue cloud of Mono Lake below. The premier destination here is probably Showers Lake, on the Pacific Crest Trail, but we actually preferred lesser known Dandanelles Lake. These are all in the Tahoe National Forest, and are part of a possible new Wilderness Area: Meiss Meadows. We've heard that Round Lake has some nice cutthroat trout, but we didn't see any. And the only fish we saw in Showers Lake were quite small. Still, this is a beautiful area that is also a great destination later in the year, when some of the high country is getting too darn cold. Meiss Lake, in a swampy meadow, is also worth a visit if you don't mind getting your boots wet. Really wet. This photo on the left is Dardanelles Lake. 12 miles in a partial loop. Devil’s Kitchen--from Drakesbad (Lassen Volcanic National Park) this is a great hike up into a lesser known volcanically active area. Part of the fun of this hike to to test the water temperature of each tiny rivulet you cross. Some are icy, and some are quite warm to the touch. The trail is not particularly steep, and once you get up towards the geothermal areas, you can smell and hear the excitement. Lots to see here, if you are willing to explore a bit and wander around. And this whole section of the park is so quiet and relaxed. Even the "lodge" at Drakesbad feels like fifty years ago. Dewey Point (Yosemite National Park, from Glacier Point Road) on the Pohono Trail. This is another 4.4 miles from Taft Point, and except for a pleasant crossing of Bridalveil Creek, it doesn't have great views. Until, that is, you get to Dewey Point. And then you have some of the very best views of the whole park. Really wonderful stuff, and not very many people here--after all, it's five miles from the nearest trailhead, and that discourages a lot of people. Don't let it discourage you. Take your time, enjoy your lunch, and enjoy the show! You can do this from the other end as well, and it is mostly uphill from the end of the tunnel at Discovery view on the road into the park from Wawona. Dinkey Lakes (In the Dinkey Lakes Wilderness, above Clovis) : The drive here seems to take forever, as you climb up out of the valley past the cars with boiling radiators. But once you are here, this is a great place to explore--a lot of lakes to see, and short distances to hike. And since the drive is a bit longer than most people like, there aren't as many people as you would expect. There are at least ten lakes in this area, and you can put together a trip that will take you to as many as you want...with nothing brutal about the hikes in between. Like Jennie Lake, this is an excellent place for a first backpack trip! From six to twelve miles, depending on how many lakes you want to see. But these are not epic hikes, they are short and lovely destinations. Lake Eleanor/Cherry Lake: (Off Highway 120 on the way into Yosemite National Park) It's always hard to pick the perfect destination for a spring hike---especially considering the weather can change pretty quickly. But this hike works well, because it's at a lower elevation, and later in the summer is too crowded to be much fun. That's because during the summer, this is a very short hike, because the road across the dam is open, and you can drive to within about a mile of Lake Eleanor. But before Memorial Day, you have to hike from the near end of the Dam at Cherry Lake, and so the hike is closer to six or seven miles, round trip. Lake Eleanor is a great destination early in the year---because there AREN'T that many people willing to make the hike. If you want to add more miles, you can continue up to Laurel Lake and Lake Vernon---but be prepared to play it by ear, and by the snow levels. Those are each higher than Eleanor, and thus snowier. That's Lake Eleanor at left, in mid-May of 2011, which was a very snowy year. And yes, the next day it snowed six inches right here--just enough to worry the mosquitoes! 7 miles, unless the road is open. Then it is no miles at all! Lake Eleanor/Cherry Lake to Miguel Meadows and beyond:Off Highway 120 on the way into Yosemite National Park) Lake Eleanor is a great destination early in the year---because there AREN'T that many people willing to make the hike. If you want to add more miles, you can continue up over the ridge to Miguel Meadows, and then along the old road to Hetch-hetchy. Veer north (left) at the rim of Hetch-hetchy to get to Laurel Lake and Lake Vernon, and then go all the way to Jack Main Canyon! From Cherry Lake this is about 20 miles to get to Laurel Lake and back. The trail here is very easy, because it used to be a road, and you can still see traces of the asphalt in places. 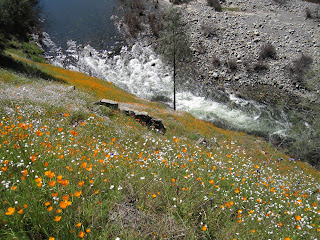 It makes a gentle climb up over the ridge and down into Miguel Meadows and then follows Miguel Creek all the way up to the top of the ridge, where it meets the road that switchbacks up from Hetch-hetchy. The trail itself is not that scenic until you get to overlook Kolana Point and Hetch-hetchy. And it still stays in the forest all the way to Laurel Lake...and only the last mile or so to Lake Vernon opens up for some nice views. Elephant Rock Lake, Rock Lake (Near Spicer Reservoir on Highway 4): This is a nice trail from the road to Spicer Reservoir. We went to Rock Lake first, which leaves a better trail for the rest of the hike. There's a fair amount of fire damage on the trail to Rock Lake. but it's growing back. And once you turn right at Rock Lake towards the Highland Lakes trail and back to the trailhead, it's a very pleasant walk--with a few views of the Dardanelles between the trees. Early in the season, we've seen more snow drops than anywhere else in the Sierra. Where the trail leaves the Highland Lakes trail to head back to the trailhead, stay left on the Highland Lakes trail for another 1/4 mile down towards the creek...and keep your eyes open. We counted well more than fifty. Elizabeth Lake: (Tioga Pass Road in Yosemite, in Tuolumne Meadows) This is a charming hike that leaves right out of the Tuolumne Meadows campground. It's only about 2.5 miles in, and it takes you to the lovely Elizabeth Lake, hard up against the impressive rock of Unicorn Peak. The first mile is a bit of a climb, the second mile is a lot easier, and follows the creek up to the lake. And when we hiked it in October of 2010, there were still plenty of brook trout in the lake, and a few smaller ones in the creek. What fun! For more adventure, follow the use trail up towards Nelson Lake for some nice views of Tuolumne Meadows and its peaks. Mt. Elwell (In the Gold Lakes Recreation area on Highway 89 North of Highway 49) is a 7800 foot peak with many lakes around it. The trail to the top is a bit of a work out, but the whole trip isn't more than about three miles. Five Lakes Basin: (Near Highway 89 Lake Tahoe) Straight out of Squaw Valley, this trail gets a ton of traffic, but we spent a lovely day hiking up to these lakes, catching a few trout, eating lunch, and heading back home again. An easy four-mile hike with about 1000 feet of elevation gain means there are lots of people--but there are also five lakes to hide in. Also very possible as a day hike as it's only about 3 miles to the first lake. Gaylor and Granite Lakes: (Tioga Pass in Yosemite) This may be our favorite shorter day hike in Yosemite. General Creek Trail: (Highway 89 on the west shore of Lake Tahoe) This is one that leaves right from the campground at Ed Z'Berg Sugar Pine Point State Park. It follows General Creek (no surprise there!) up to Lily Pad and eventually Duck Lake. It's a nice work out, and if you are staying that the park it's worth doing some evening just to see if you spot any animals. But it doesn't have great views, and Lily Pad lake is...full of lily pads. The Grand Canyon of the Tuolumne:( Highway 120 in Yosemite National Park) We'd love to tell you all about this hike, but we haven't done it. It is certainly one of the great hikes in the park, and we were all set in 2009, with permits already issued. But when we arrived at the park, the rangers told us that a forest fire was burning out of control in the canyon, and they weren't letting anyone in. So we went somewhere else. (Kibbie Ridge trail out to Boundary Lake). And now we think we'll wait a bit before we plan on this trip again. After all, those heavily burned areas are just not as nice to hike through. sigh. But someday we'll do it. 28 miles total. A wonderful hike that takes you up the mountain for a bout a mile until you pass Granite Lake (Photo at left). This is a nice day hike destination, and worths a stop. But then it gets good. The trail leads you out on top of a wild ridge, then across that ridge for a few miles until you overlook Grouse Lake, about 1000 feet below. The views on this section of the trail are simply wonderful, across miles and miles of the Sierra. Then you go down to Grouse Lake--straight down. There are no fish there, at least not that we saw. And your next stop is to turn around and head right back up again. That's work. But this is a perfect hike for those days when the other trails are going to be packed with people. There are not many fish in Grouse Lake, but Summit Creek below the lake is supposed to have fish, and the canyon down there looks truly inaccessible and wild. The perfect spot for bushwacking fishermen! The total round trip is ten miles, and the scenery in the middle will simply take your breath away. Grouse Ridge; (Off Highway 20 just west of where it meets I-80), this is a great trailhead with a ton of lakes as potential destinations. And the best part of this hike is that the first two miles is downhill. The only real uphill is on the way back out, when your packs are much lighter! From the Grouse Ridge campground and fire lookout, you can select which lake you’d like to visit. Then hike down to the lakes, keeping your eye out for good campsites. This can be as short as a two or three-mile hike for an overnight, or you can visit a few lakes over the course of a few days. Glacier Lake, at the eastern end, is lovely, but there are plenty more to choose from. And fishing is quite good in this area, for rainbows and browns. Half Dome (Yosemite Valley): We have listed this hike in both sections of Yosemite, because you can do it both ways. The most popular way is from out of Yosemite Valley and Happy Isle, but you can also do it as a LONG dayhike from Tenaya Lake, for example, and even throw in Cloud's Rest if you are completely masochistic or in Olympic condition. One way or the other, you probable have to do this hike , just so that you can say that you have done it. But that doesn't make it the best hike in Yosemite, because it isn't. And either way, we suggest that you leave VERY early in the morning, befor dawn, so that you can not only get most of the climbing out of the way before it heats up--you also want to try to get to the base of the cables before the line gets too long. And while there may be gloves waiting for you at the bottom of the cables, it would make sense for you to bring your own, just in case they have disappeared or been cleaned up. The cables themselves are steep, strenuous, and serious. Someone on them will get very scared, and slow things down a lot. This is not a hike for those who love solitude, or have little patience with their fellow men and women. Yes, there is a line to go up the cables. And now you need a permit as well. And it takes a long time, and there are stupid people on the trail who really shouldn't be there, and who make it harder for everyone else. The new permit system (2011) may improve things. The easiest way to do this hike is as part of a backpacking trip, when you can sleep at Sunrise and hit the cables bright and early in the morning. 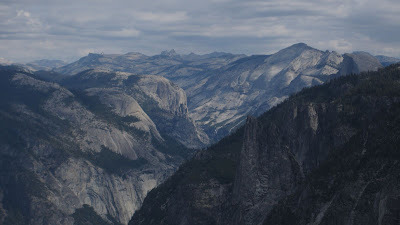 The view from the top of Half Dome will exceed your every expectation. From Yosemite Valley its 16 miles +/_., with about 5,000 vertical feet of climbing. Highland Lakes and the Canyon HIghway 4 above Lake Alpine) --This is a great trail down the river will allow you to fish for about twelve miles, uninterrupted, all the way to Spicer Reservoir. You get there by taking the road to Highland Lakes below Ebbetts Pass, and we do not recommended taking a large RV or bulky vehicle on this road--we have seen both an RV and a boat trailer stuck here. Once you start down the canyon, this hike doesn't have quite the scenery of the high mountain lakes, but that's the price you pay for the fishing. The Mokulumne River has lots of rainbows and browns in it, and we have also seen a Pine Marten in this area, working his way a long the river, looking for his own dinner. Once you get to Spicer, you can either shuttle out, or hike back up to Highland Lakes via Jenkins Canyon and Arnot Creek. Hite Cove, Sierra National Forest (Highway 140 near Yosemite) This one is good just about any time the weather is nice, because the elevation is only about 1800 feet, and there are no prolonged climbs anywhere on the trail. You leave from the trailhead at Savage's Trading Post off Highway 140, between Mariposa and Yosemite, and then follow the South Fork of the Merced River about 4.5 miles into an old mining camp on the river. The only steep part is right where you start the trail, althrough there are some tricky sections where you realize how good the trails are in the rest of California. There are some nice views up and down the river, and during fishing season this must be even more fun. But the real spectacle comes during the wildflower season, when some of the early slopes of the hike are simply covered with poppies and other flowers. This trail will get a lot of traffic on the wildflower weekends, but we hiked it on a Friday in March, and saw about ten people as we hiked in--and they were all on their way out. 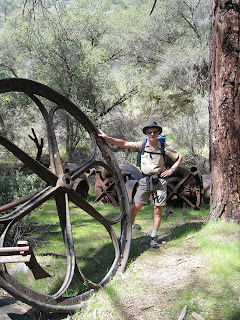 We had the campsite and old mining equipment to ourselves for the evening. And on the way out, we saw crowds heading up the trail...but by that time we were on our way home...and into Yosemite for a little sight-seeing in the spring. Ice House Reservoir and beyond (Highway 50): The road to Ice House is always open, because the SMUD keeps the road plowed to the reservoir even in the winter. And there are some nice hikes in this area. We hiked the dirt road along the reservoir itself, starting at the Strawberry Campground and then continuing to the lovely rapids and cascades that empty into the lake at the east end. The road is about two miles long, and quite easy. In fact, we saw someone drive it in a Buick. But once the road ends, the trail gets steep. And after half a mile or so, it runs right up into a major granite outcropping. You can climb up this (we went up the route through the granite along the creek, which is class 3 and 4, and came down the hillside northwest of this, which was much easier. And if we had had the time, we would have loved to explore further up this canyon. The stairstep rapids are really wonderful in early summer when the creek is roaring with snowmelt. Take a look at the photo at right, taken in June of 2011. Apparently, when the water goes down a bit, people kayak this stretch. Have you always wanted to take a nice trip off to a distant lake, nestled amid granite peaks, where you will find solitude, stunning beauty and great fishing? This trip is one to consider. We like doing it from the Mono Meadow trail head, for a couple of reasons: it's easier to get a permit for Mono Meadows, and it actually saves you about a mile on the trail in each direction. Plus you avoid the crowds and traffic of Glacier Point. The trail leads down to Mono Meadows in a steep mile, then continues a less steep descent, crossing the Buena Vista trail into the Illilouette Canyon, and crossing Illilouette Creek. From here it is a long gentle ascent up the canyon, through an area that burned about ten years ago, with some nice views of Mt. Starr King and the Clark Range. Once the trail wends its way back to the creek, about five miles above the creek crossing, there are lots of good campsites. That's a photo of the creek near our campsite below. The trail then leads up the canyon again. We stopped at Upper Merced Pass Lake, which is lovely, for lunch. There we met a team of biologists who were making sure the frogs were alive and well. No fish in Upper Merced, as near as we could tell. From there the the final climb up to Lower Ottaway Lake is wonderful, with trees growing straight out of solid granite slabs. The photo above shows Lower Ottaway Lake at sunset. And you can probably see fish rising...there were so many that it was hard to take the photo and get a clear reflection in the water. A note: this is above the fire limit, so no campfires are allowed. Which hasn't prevented some people from building fires. The hike back down is a simple matter, but for more fun you could continue past Upper Ottoway Lake and over Red Peak Pass, which takes you into the upper canyon of the Merced River, and down into Little Yosemite Valley, or out over Vogelsang Pass, or...well you get the idea. It's 32 miles rt on this route. Illilouette Canyon (Yosemite Valley): OK--this one is not recommended by the rangers, and there is no trail at all. In fact, we know at least one person who was told that you need ropes and climbing gear to get here. You need arms and legs, and an indomitable will to plug away uphill through some dense brush and really big boulders. And you need to be smart, not stupid. You start by the Happy Isles Nature Center, and follow the trail up past the display about the rock falls, and into Illilouette Canyon. When you get to first bridge across the creek; stop. Don't cross the creek. There should be a huge water tank on your right. Turn right and go past the tank and keep climbing up the canyon, always staying to the right of the creek. There is no trail. It gets steep. It gets brushy and full of massive boulders. But you eventually get up above most of the trees, and at that point you have some great views of the back of Half Dome, and up Merced Canyon above Vernal Falls. t’s five miles of hiking, and if you have time, you can take another day and work your way up to the top of the peak, as well. From the same trailhead, you can also climb Mitchell Peak, which is over 10,000 feet and has absolutely stunning views of the southern Sierra. One of the greatest day hikes in California--maybe the best of all. Mt Judah (Highway 80):This trail leads straight out of the Sugar Bowl Ski Area parking lot, and in about 4 miles takes you up to the top of Mt. Judah, overlooking Donner Lake and the Crystal Range to the south. Mt. Judah is about 8200 feet, and you can continue on this hike to bag a couple more peaks, if that is what gets you excited. The trail runs along the ridge for quite a while, so if you have the time and the inclination, you are in for a great hike. One a sunny day, with the flowers blooming and the peaks soaring off in the distance, this is about as much fun as you can have at Donner Pass. Kennedy Meadows to Iceland and RIdge Lakes: This trip goes cross-country to a series of lakes for which there is no trail, only sloping slabs of granite and a topo map to guide you. We started at Kennedy Meadows and followed the horses and manure for five miles up to the junction with the trail to Lower Relief Valley. It had rained torrents the night before (we met one group who weathered five hours of thunder, lightning, and pouring rain near Emigrant Lake) and so our normally dry Sierra felt like a sauna. Steam was rising off the rocks, and we were sweating like...well, we were sweating. That's the gorge below left...and you can see the steam rising. But once we got above Relief Reservoir, things got a lot better. The trail goes through a very steep climb here, and after lunch we stopped at Summit Creek to enjoy the water, the view...and what the heck, let's camp here. That afternoon P took a recon hike up the granite just to make sure this route was possible...and came back down full of confidence. That's the view from near our campsite, below right. The next morning we were up early and hiking straight up the smooth granite. What a wonderful way to explore the Sierra! The views opened up, and there were so many fabulous trees struggling in the granite that we kept stopping to take photos of them. In about an hour we were up at the top of the pass, and then pulled out our map and compass to make sure we were headed in the right direction. We contoured around the granite bowl, and ended up right where we wanted to be, at the northern corner of Ridge Lake. From there we hiked around to explore the three other lakes, fish a bit, and spend the day far from the madding crowds below. Wonderful. The sky was full of fluffy clouds, and we just wandered from one great spot to the next. The last day was Friday, and we started early to beat the heat. Most of the hike back down to Kennedy Meadows was in shadow...but we also ran into seven (yep, seven!) groups of horses, from three to fourteen people in each. Add in a few groups of hikers, and it sure felt different from Iceland Lake. This is not a trip for those who want a nice hike along a well-marked trail. In fact, the lakes in question are well off the trail, and take quite a bit of navigation. But they are lovely lakes, and we promise you that you won't see many people up in this area. And the scenery and fishing is pretty darn amazing. (Note--we did not see a single fish at Iceland lake--only pollywogs. But Ridge Lake and its companion were full of fish, as was Summit Creek. King’s Creek Falls and Beyond (Lassen National Park)--this is a lovely hike down past the falls at into the alpine valleys of the park. You can even find a few fish in Kings Creek, further down. And it makes a nice through hike to Summit Lake campground if you can manage the car shuttle. You can also extend it to the southeast and visit Bench Lake with its view of the geothermal areas in the southern park of the park. 5-7 miles, depending on how far you want to go down. Kinney Lakes and beyond (Ebbetts Pass on Highway 4) --This is the Pacific Crest Trail heading north out of Ebbetts Pass. The first of these lakes is right along the highway, and they are reservoirs, so there's bathtub ring around them most of the year. And there are small brook trout as well. But this isn't the scenic highlight of the area. On the other hand, If you keep going north, you do get up to where you get some nice views. And eventually you can work your way up to Fourth of July Lake and Carson Pass, which is a great through-hike if you can manage the car shuttles. Lassen Peak (Lassen National Park)--yes, you have to do this one so that you can buy a pin in the gift shop that says "I climbed the Volcano." The trail starts near the highest point of Highway 89 as it wends its way through the park--easily one on of the most beautiful highways in America. And above Emerald Lake and Lake Helen, there's a parking area for the trail. It's a straight shot slog up the side of the peak, and be prepared for a lot of wind on top. The views as far as Mt. Shasta and the Trinity Alps, are amazing, and so are the crowds on most days. 5 miles round trip. Leavitt Meadows and the West Walker River: (East Side Highway 108, over Sonora Pass) This is one great area--now part of the Hoover Wilderness as of 2010 and just amazing scenery. Plus, the permits are available on a self-serve basis at the trailhead! We worked our way up the West Walker River trail, then forded the river (in early July of 2010 this was no laughing matter--we had to go past the first ford, and then come back on one of the other use trails to get to the easier ford...and it was still exciting.) and climbed up to Fremont Lake, 8.5 miles from the trailhead. From there we went through Walker Meadows and up the creek to camp at Cinko Lake---which is the photo we have include here below right. It won't have this much snow when you get here---we were the first people into the lake this year--and that was over 4th of July weekend. This is a truly lovely spot, and the fishing was all sorts of fun. And then past Cinko Lake, along the Pacific Crest Trail to Cascade Creek...( If you wanted, you could also take the PCT up to Harriet Lake and beyond. over Dorothy Lake Pass into Yosemite, but we didn't have time on this trip) and down the creek to the West Walker again. Long Canyon is a very tough, steep climb for the first mile or two...but there are both views and waterfalls that give you a chance to rest...and then it opens up into a stunning meadow, shown at left. At little later in the year, we would have continued on to Bear Trap Lake...but it was too snowy for us. So we camped here and enjoyed the silence and solitude. The sunset on the peak here is a treasured memory. The next morning we scraped a little frost off the dishes and packe up. And on the way out, we also stopped at Roosevelt Lake and took the scenic (and mountainous) route back through Secret Lake. All good places to camp...but these lower lakes will certainly have more people than the high country. Here's the blog entry: West Walker River Trip Report 30+ miles. Lembert Dome (Tuolumne Meadows in Yosemite) is a bit like Sentinel Dome on the road to Glacier Point. It's only a mile from the trailhead on the Tioga Road (instead of parking in the lot at the Dog Lake trailhead) but the first half mile goes straight up. Then you are up on the ridge, and the rest of the hike is an easy walk up to the top of the dome. 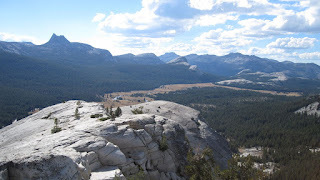 Stunning views of the whole Cathedral Range and the scenery around Tuolumne Meadows. Take a map so that you can pick out the peaks and domes. But this one can be really crowded. It's best to do it in the off season. We did it in mid-October, and met only four people on the trail. And the views were....worth every step of it! 2-3 miles, total. Little Yosemite Valley—through hike, or from Happy Isles, including Vernal Falls, the Mist Trail, Nevada Falls, and Half Dome (Yosemite Valley): This is the big one--the first section of the John Muir Trail--and the first real backpacking trip that many people take in Yosemite. P did it forty years ago with his younger sister. The most popular way to do this hike is to start at Happy Isles, climb up past the two waterfalls, and then camp in Little Yosemite Valley. Be prepared for bears and lots of people here. It's the main reason we avoid this hike these days--because the scenery is still choice. We've also extended this hike up the Valley even further to camp near Merced Lake or even Washburn Lake. 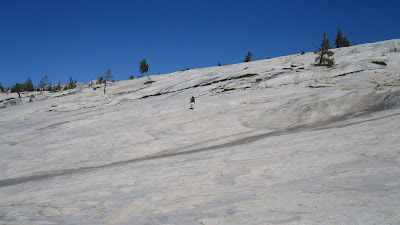 The next day you have an easy day-hike up to Half Dome, and then you can hike back out again. But the route we prefer is to start at Tuolumne Meadows and climb up the Rafferty Creek Trail to Vogelsang High Sierra Camp. The next day is an easy hike down Lewis or Fletcher Creek to Merced Lake, and then you can head downhill the whole way to Happy Isles. Either way, it is a gorgeous trip, if you don't mind company. We've even done that last part of this hike, down past the waterfalls, under a full moon at night. The trail was easy to follow, and the memories are with us still today. Loch Leven Lakes (Highway 80 near Donner Pass): There are three Loch Leven Lakes (and since "loch" means lake, there's an extra lake in the name, too!) 3.5 miles of pretty much uphill climbing takes you right out of the I-80 pass and over the ridge to these three lovely lakes. You'll cross the railroad tracks and just keep on climbing up. Loon Lake to Spider Lake and Rockbound Lake (On Ice House Road off Highway 50): In 2011, when the snowpack seemed as if it would stay on the mountains forever, we headed up this way in late June. And while we had to tramp through soggy trails, ford creeks that were well outside their channels, and search for the trail from time to time under a few feet of snow, we made it. And we think you could make it, too. The first few miles are along the southern side of Loon Lake, and offer lovely views of the lake itself. You can even hear the OHV trail on the far side of the lake, as the testosterone gets running and the motors start roaring. But once you get past the trail to Pleasant Camp, the trail becomes an old road, which is both easy to follow and pretty darn nice after all that slogging. It leads you past the eastern end of Loon Lake, and then goes up over the ridge to a series of nice lakes. The only concern you should have early in the season is crossing Rubicon Creek beyond the lake....it can be really roaring. Still this is a nice alternative to higher elevation hikes, as it never gets above 7,000. That's Loon Lake in the photo above , just before the trail heads up over the pass. 11-12 miles rt. Lost Lake, Sword Lake, and Spicer Reservoir: (Highway 108 near Clarks Fork) We took this trip in June of 2010, a snowy year that meant many other trails would be covered with snow or under water. So was this one. But the hike was still great. In fact, it's probably better when the conditions are a little difficult. The trail is easy enough from the County Line trailhead that it can get overrun in the middle of summe r. But with the late snows, we had to break our trail from the Wheat's Meadow trailhead, and we had the place to ourselves. The first two miles were a simple climb up and down the ridge, and then we had two miles of wandering up the Dardanelles Creek watershed in the snow. The trail was either under snow or under water, but we managed to navigate with map, compass, and a lot of stopping and looking around. Lukens Lake is a simple little hike off the Tioga Road just east of White Wolf. It's a mile to the lake, and there are fish in the lake. A nice meadow completes the picture. Again, don't do this in the middle of summer, but in the fall, when the people have gone. And on your way back to the car, take time to stop on the top of the saddle, and climb 75 yards out to your left onto the ridge to the east. You have a great view of the Clark Range from here...and a little peace and quiet all to yourselves. How nice is that? Lyons Lake/Lake Silvia: (Highway 50 on the road to Wrights Lake) A nice five mile hike brings you to a stunning granite bowl with deep blue water, brook trout, and not very many people. The trail starts out easily from the trailhead, then starts a moderate climb up to the junction with the trail to Lake Silvia. A lot of people take that right hand trail, and settle for camping at Lake Silvia. Don't do that. You may have heard that the last half-mile to Lyons Lake was brutal. It's bad, but not that bad, and not even half a mile. And Lyons Lake is so much more attractive the Lake Silvia--with better fishing, too! We camped across the creek, against the cliffs that are on the southeast side of the lake, and had a lovely time with great views. And from here you can easily clamber up the peak to the west of the lake for views over most of the Wright's Lake basin. That's an adventure well worth the trouble. 11-12 miles or so, rt, particularly if you make the effort to go see Lake Silvia as well. Lyell Canyon and beyond: (Highway 120 in Tuolumne Meadows, Yosemite National Park) Lyell Canyon is the gateway for the John Muir Trail through the high country of Yosemite--and it's a beautiful hike on its own, even if you don't go beyond the canyon itself. You start at Tuolumne Meadows and head south along the Lyell Fork of the Tuolumne River...and you just keep going. About two or three miles in, you get to the open meadows of the canyon, and from there it just gets better. You can follow this all the way to the head of the canyon, over Donahue Pass, into some of the best scenery in the Sierra. Or you can do a nice loop by turning right and going up past Ireland and Evelyn Lakes and back down by the Vogelsang High Sierra Camp. Did I mention that there are some nice trout in the Lyell Fork? There are, although by late in the season they are pretty spooky, at least during the middle of the day. And it is illegal to camp within four miles of the road, so some of the best fishing is only accessible by day hiking to it...and maybe hiking out after dark. And doesn't that sound like a good adventure some time? As a dayhike, you can also work your way up to the top of Mammoth Peak, just east of the meadows. It's a great climb with wonderful views--just don't try to come straight down the north face. We did, 40 years ago, and almost didn't make it! The JMT runs over 200 miles south to Mt Whitney. Lake Margaret: (Carson Pass, Highway 88) This is an easy 2.5 mile hike down from the pass into the Tahoe National Forest. The lake will get a lot of dayhikers, but it's quiet in the morning and evening, and there are some fish in the lake. The creek on the way is so beautiful that many dayhikers get distracted on a hot day and never make it to the lake! It's also a good hike for early or later in the year, as the elevation is a good 1000 feet lower than any of the others in this region, and consequently less likely to be covered with snow. May Lake and Mt. Hoffmann: (Highway 120 through Yosemite National Park) Is this the most popular backpacking destination in Yosemite? If not, it's one of them. The trailhead leaves from a part of the Old Tioga Road that no longer connects, and it's just a short mile or two to May Lake. This is one of the High Sierra Camps, where you can pay a lot of money to have someone else cook your food, and sleep in tent/cabins that you don't have to pack up later. It's a good solution for those who fly in for a few days, but as locals, we don't really see the advantages. The other factor that these High Sierra Camps bring to the lake is people. These are popular camps, so the backpacking camp at May Lake is quite a facility, complete with toilets and pumped water. We've even seen someone with a ukelele here. But for a first trip that might include a little adventure, this is still a good place to start. And the adventure would be to follow the new (and in 2009 still not completely convincing) trail up to the top of Mt Hoffmann. For years there was a primitive use trail up to this peak, and the Park Service decided to spend some money and build out the trail. Well, maybe so. But there are still a lot of places where it is very steep and sandy/rocky. And the last 300 feet up to the peak is still a scramble--requiring the use of hands as well as feet. But it's over boulders, and it's not really dangerous--just a little intimidating if you think of a trail as something that is easy to walk. The views from Mt. Hoffmann (over 10,000 feet) are some of the best in Yosemite--in all directions. And the series of lakes just under the crest to the west really does look inviting. hmmm. 4 miles to May Lake, round trip. Merced Grove: (Highway 120/Big Oak Flat Road, Yosemite) This is a lesser known hike that will take you into some nice giant Sequoias below Crane Flat. It follows an old logging road for much of the way, so it isn't exactly single-track, but when other parts of the park are crammed with people, this one is usually a little calmer. Mist Falls: (Cedar Grove, Kings Canyon National Park) If you do just one day hike out of Road's End in Kings Canyon, this should be it. It is certainly the easiest, as it only climbs a few hundred feet along the river up the canyon, while the others take a steeper route straight up the side. And this one takes you to a wonderful waterfall. You might even catch a few fish here. It starts with a mile or two through the valley, on a soft and sandy trail, then eventually turns left and follows the creek up to the falls. The falls are really lovely--that's one of our daughters pretending to be the siren of the falls at left. Beware of rattlesnakes here--this is one area where we have actually heard/seen them. And go early in the morning, so that you can leave before the real crowd arrives to eat lunch. If you really want some fun, keep going up the trail--you can take it all the way to Paradise Valley, which is 7 miles in, with stunning views of the Sphinx across the canyon. And that makes for a terrific day hike! Mitchell Peak:(Sequoia/Kings Canyon National Parks) This is perhaps our all time favorite day hike. Like the hike to Jennie Lake, it starts at a trailhead well off the beaten track, on the way from Grant's Grove to Sequoia, and the rough and tumble dirt road is almost more than you can bear for a passenger car. But once you get out on the trail, this one is just spectacular. It heads up a slope, then across to show views down into a lovely creek. More climbing takes you through a meadow or two (look out for mosquitoes early in the year--they were worse here than anything P has ever seen one July) and then up to a saddle. From the saddle you can go east into the Sugarloaf region, south towards Jennie Lake, or north and climb Mitchell Peak. The climb to the peak is steadily uphill, and you eventually work your way all the way to the northwest side of the mountain before clambering over some granite boulders to the summit. Take your time, keep your pace, and you will make it with ease. This hike is on everyone's Top Ten Hikes...unless they haven't done it. Do it. Mokelumne River Canyon:( Highway 4 near Lake Alpine) This is not your normal high country trail. It leaves from a couple of miles below Bear Valley, and just heads straight up over the ridge on an old jeep trail. From the top of the ridge, it plummets straight down to the river thorugh a series of tight narrow switchbacks that will have your knees shaking. Once you get there, there are some use trails that allow you to go upriver or down....although down river involves some pretty good bushwhacking in either direction after a while. There are a few nice views on the way down, but this is a fisherman's hike. And yes, when you get to the river there are fish. Lots of river to explore here. Just be careful if you want to cross over to the other side...pick a nice, slow-moving section and wade across--don't try anything silly. 8 miles rt...plus exploring. Mono Creek/Laurel Creek/Lake Thomas Edison:(John Muir Wilderness) This is a great part of the Sierra to explore--but only if you can stand the drive. It's pretty much two hours from the Prather Ranger station to Lake Edison...and the last hour is only about 15 miles. You don't want to do this one over the weekend! But once here, you have access to some wonderful country--and thanks to that long drive, many of the hikers are PCT/JMT thru-hikers. We took the ferry across the lake, and hiked up Mono Creek to Laurel Creek, and then up into Laurel Canyon for some of the best views we've seen in quite a while. And while the fish are small, there are plenty of brookies here. The fact that Laurel Creek isn't on the way to anywhere else means you will not see many people here, either. That's the first meadow in Laurel Canyon in the photo...a steep 1,000 climb up from Mono Creek...but well worth it! About 20 miles rt. 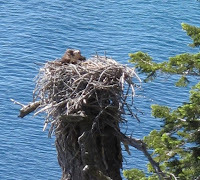 Here is the blog from our trip: Lake Edison and Mono Creek. Mono Lake (Highway 395 just east of Yosemite) This is also a destination you should consider while you are in Yosemite, It's easy enough to find once you go over the top of Tioga Pass, and there are some interesting trails and sights to see. Remember as you explore this area that the Piute indians used to call this home. And they found enough to live on in this near desert wasteland. That's the playa at Mono Lake at left. There is a visitor's center, some short trails to hike, and some nice volcanic landscape to explore. Please rememver to keep of the tufa--those towering deposits of minerals that make this seem like a landscape from Star Wars. Moro Rock: (Sequoia National Park) OK, it's not really much of a hike---more of a side-trip/clamber. But it's loads of fun, and the views from on top can be quite spectacular. This is very short, maybe 1/2 a mile, and a lot of it is along cracks and crannies working your way out to the top of the rock. But don't worry, there are railings all around all the way, so it's safe as safe can be. Of course, we remember when you could get to the top and see the whole San Joaquin Valley from the top. Now, with the air pollution, you're lucky if you can see much at all. But it is still a wonderful rock to climb. Montecito/Sequoia Big Baldy Ridge: (Sequoia National Park) Not far from the road that takes you to Mitchell Peak is the Montecito Sequoia family camp. It's a nice place for people who have kids and want to spend some time in the mountains--while enjoying both the mountains and day care for the kids. And just to the west of the camp is a very nice hike out along a ridge that has wonderful views both east to the Great Western Divide, and west out over the San Joaquin Valley. Not strenuous, and there is no lake at the end--you just hike until you decide you have seen enough, usually the dome of Little Baldy, and then you turn around. Nelson Lake: (Higway 120, Tuolumne Meadows, Yosemite National Park) This is one of the secret locations in Yosemite that can get you into the back country when all the other trailheads are full. The trail leaves from the Elizabeth lake trailhead, but you can only get a wilderness permit for the area if you specify Nelson Lake. There is no overnight camping at Elizabeth Lake, and there is no maintained trail to Nelson Lake. But there is a non-maintained and easy to follow trail most of the way....and a good sense of direction and a map should get you the rest of the way. The payoff? A beautiful lake with very few people. That's Nelson Lake at left. And a wilderness permit on one of those weekends when there is no other possiblity at all. This is a lovely hike, and when every other option is closed, there is still usually room for a couple of people at Nelson Lake. Even if you never find the lake, the hike over the pass and into Echo Canyon is delightful. And just steep enough to keep out the riff-raff. 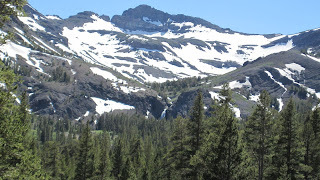 And if you want an adventure, follow the canyon from Nelson Lake up past Reymann Lake and over the ridge---that will put you in Rafferty Canyon---and you can follow the trails there up to Tuolumne Pass for lots more adventure, and many more miles. Here's the blog entry from that trip: Yosemite's Less Visited Lakes. Or you can go down Echo Canyon all the way to Merced Lake (about eight miles?) and pick up the trails from there that lead to Half Dome, Happy Isles, or Red Peak Pass. Six miles one way from Tuolumne Meadows to Nelson Lake. After that, the world is your oyster! Noble Lake-- (Highway 4 at Ebbetts Pass) A great four mile hike along the Pacific Crest Trail, heading south from Ebbetts Pass. From here you can walk all the way to Yosemite, if you want, or you can just stop at Noble Lake and catch nice fat brook trout. Or go for a swim. And we should warn you that in June and early July, the wildflowers on the early sections of this trail are among the most astonishing in all the Sierra. The local papers even run special stories to let people know when the blooms are at their brightest. We have never seen lupine like this anywhere else! Sections of this trail, particularly the last couple of miles, are pretty steep over exposed volcanic rock, but the views are well worth it, as are the wonderful trees. North Dome: (Highway 120 in Yosemite National Park) This is often done as a day hike, but it also makes a very nice overnighter, and the trail quotas are rarely full, even in the middle of summer. You begin at Porcupine Flat, and the trail works its way slowly but surely down the canyon. Once you get to the junction with the Indian Arch trail the day hikers may choose to go left, and visit the only stone arch in Yosemite. That's the arch in the photo below, and it's well worth the climb up to it. Backpackers are better served going right and following the creek for a couple of miles down Tehamite Creek to the junction with the Yosemite Falls trail. Camp at the creek, where there is water year round, and the next day makes for an easy hike up out of the canyon and onto the rim of Yosemite Valley. That's M in front of Cloud's Rest...perched on the edge of North Dome. The side-trail that leads you down to North Dome has its exciting moments, but not on the Dome itself. That part is relatively flat and easy, and well marked with some of the most distinctive cairns in the back country. But the side trail down to the shoulder of North Dome is very steep and has some exposure. If you are worried about heights, this would not be a good place to explore. We don't want to scare you, because M isn't a great fan of exposure, and she did this trail. But it made her stop and think a bit. To our knowledge, nobody has ever fallen here, but the cliffs down towards the Valley do really get your attention. Once out on North Dome, you have great views of the Valley in all directions, and a lovely sense of sitting in the middle of it all. And on the way out you get the best views on the whole hike by taking that spur trail up to Indian Rock arch. There you have vistas to the east of the Clark Range and Half Dome as good as you can find anywhere. 10 miles rt. Pacific Grade to Bull Run Peak and beyond: (Highway 4 above Lake Alpine) This trail starts as a dirt road in lovely Pacific Grade Valley. Once you get past the cattle gate it climbs up into the mountains along streams and through a lovely meadow. The stream has trout, the pass is a great entry point into the Carson-Iceberg Wilderness, and the views are well worth the effort. It's about 3.5 miles to the pass, another half mile to the top of the peak. And once over the pass, you can hike forever, as you can see from the photo below. 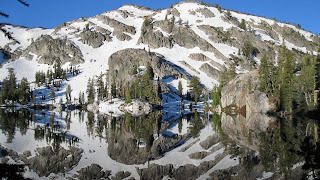 Paradise Lake: (Highway 80 near Donner Pass) There is a bit of cross-country involved in this hike, but the main trailhead is easy to find, and if you are a bit adventurous you can make a nice 2-3 day trip exploring this area just to the North of I-80. You start at the Castle Peak trailhead and climb the old fire road to the top of the ridge. After that it's a few more miles toward the north and east as you work your way into the lake. Over all it's a total of 6-7 miles to the lake from the trailhead. Paradise Meadows: (Lassen National Park) This is one sweet hike, up the creek until you find yourself in a delightful alpine bowl, with a golden meadow, a burbling brook, and towering peaks. And then you have lunch, and a nap, and finally decide it's time to go back to the car. sigh. You can also do this from the upper part of the Lassen Road, and come down from Terrace Lake. That's easier, but somehow the meadow doesn't seem quite so special in that direction. 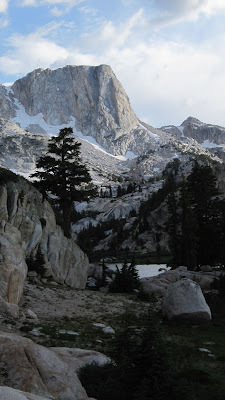 Paradise Valley: the most popular backpacking trip in Kings Canyon is the trip up past Mist Falls into Paradise Valley. 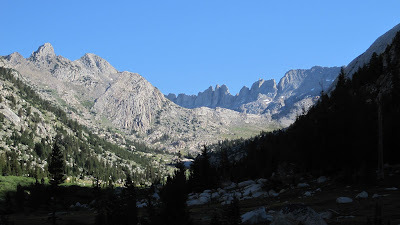 You can camp there the first night, and then either hike back out or continue on through the Sixty Lakes Basin, one of the great destinations of the High Sierra, and come back out via the Bubbs Creek Trail. This is great hiking, and there are lots of other side trips that call to you once you look at the map. Fishing here can also be pretty darn good, and that just adds to the overall attraction. P first did this trip when he was 12 years old with his older sister and her friend. If you are used to Yosemite Valley, Road's End in Kings Canyon will surprise you. It's a quiet little spot with about thirty parking spaces, and it's the main trailhead out of the canyon. What a peaceful place. Where do you think they came up with that name? 13 miles rt. Peepsight Peak: (Highland Lakes Road off Highway 4 above Lake Alpine) We loved the first few miles of the trail, which takes you from Highland Lakes Roads out to the West past wonderful Milk Ranch meadows. And the west end of the meadows, the trail reaches the morraine with amazing junipers on the ridge--the best we've seen. But at this point the trail disappears. We looked for 45 minutes, and never did find it. It may go uphill to the right above the meadow, but we'll never know. We never found it. And we still loved the hike. Pinecrest Lake and Cleo's Baths: (Highway 108) The hike around pinecrest lake is a pleasant stroll, and in the summer time the temperatures might just get warm enough to encourage you to take a dip in the lake. You'll pass cute cabins, warm rocks, and inviting water all along the hike. And if you are feeling a bit more adventurous, you can take the use trail (marked with a sign and painted arrows these days) to Cleo's Bath--a series of deep pools in the creek that feeds the lake. This is a tough climb up the rocks of a moraine, so be prepared to scramble and maybe even scrape a knee. When you get there, you can relax in the cool waters of the creek--unless you go too late in the year. By August Cleo sometimes has to take dust baths, as the water dries up. 6 miles. This is in the Stanislaus National Forest, and part of the Rim Fire from three years ago. The area had been closed for some time, but now it's open, and we were ready for an adventure. It's a beautiful trail for a spring hike, and the weather fully cooperated with temperatures in the high 60s in the afternoon. By the time we got the to the trailhead it was 10:30, and so we managed to get to the falls in time to eat lunch. poison oak look so lush. And it was everywhere. We had to be careful not only about where we walked, but where we put our packs, our hands...There was a lot of poison oak. And there were quite a few trees down across the trail, most of them left over from the Rim Fire. Some had been removed by trail crews, but at least one of them made for some interesting "hiking" for about twenty feet along a ridge. See the photo here. That's M working her way through the limbs of the tree, and dragging her pack along as she went. There was no way to wear the pack though this section, and she had cliffs both above and below her. And then there was the river, running high and strong this spring after four years of drought. It was wonderful. The falls themselves are nice, but not anything like the other falls you can find in Yosemite. But that didn't keep us from having a wonderful time on a trail that never gets above about 3,000 feet. A perfect "first hike" of the season. And we did think about taking the hike up the river a bit farther. But it was an out and out scramble over cliffs and talus, covered with poison oak, and obstructed with trees. Given the possibilities for real disaster--or at least real poison oak--we folded out tents and headed home. Polly Dome Lakes: (Near Tenaya Lake on Highway 120 in Yosemite) This is a sweet little hike out of the Tenaya Lake area, using the Murphy Creek Trailhead. It's not hard, only about 2.5 miles and it leads to a few nice little lakes that have plenty of water, even late in the season. Your map may not show the trail to the lake itself as a spur trail off the Murphy Creek trail, but there is a huge cairn marking the "cross-country" route and very well marked trail all the way to the lake. Don't worry about the steep climb on this spur trail--it only lasts about 100 yards. And you get a quiet little backpack camp within 90 minutes of Tioga Road. How cool is that? 6 miles rt. And while you are at it, you might also take the short hike to Pothole Dome on the western end of Tuolumne Meadows. This is a very short hike, less than a mile, that goes around (and please OBEY the signs that ask you to protect the meadows themselves by going AROUND) the western end of Tuolumne Meadows and then up onto the top of this gentle dome. The views here are spectacular, and include all the peaks of the Cathedral Range, plus a tiny glimpse into the granite of the Grand Canyon of the Tuolumne. The photo at right is Unicorn Peak from Pothole Dome in January of 2012, when there was almost no snow and Tioga Pass road was open. I hope that never happens again in our lifetime! When you drive into Yosemite from Big Oak Flat on Highway 120, you'll pass the turnoff to Cherry Lake. And just before you get there, you'll see the turnoff to Rainbow Pool on the right. This is a nice local picnic spot with a lovely swimming hole and waterfall. P stopped there 40 years ago with a busload of campers on a hot day, and it was a very welcome respite. There's even a cliff to jump off, if you have the stomach for it...which P did then. He doesn't, now. Here's a photo of the waterfall. Rancheria Falls: (Highway 120 in Yosemite) The Hetch-hetchy region is one that doesn't get a lot of attention from visitors to Yosemite, so we love it. And this lower elevation area is open long before the high country is passable, so it's a great destination for early trips. The trail to Rancheria Falls is simple and straightforward. In fact, you can stand on the dam at the foot of the lake and see where the trail goes. There is only one part of that huge granite cliff beyond Wapama Falls that looks as if a trail could go there. It does, following a line of trees and brush that cling to a shelf above the reservoir. Wapama Falls is a great destination on its own for a day hike, and the route there will also pass a number of other cascades early in the year. As in the rest of Yosemite, the waterfalls are less impressive in August or September. But those are longer hikes. It's just 6.5 miles to Rancheria Falls, and if you make that your base camp, you can fish the creek and explore this area for another day. The side trip up to LeConte Point is will worth the effort. The best way is to look for the big cairn on the trail up the ridge above Rancheria Creek...then just follow those cairns to the top. Or you can work your way all the way to the top of the ridge, and just follow your nose and eyes to LeConte Point. The views here are amazing: down into the Grand Canyon of the Tuolumne, or east to the Sierra Crest, or North to the boundary with Emigrant Wilderness. It makes you wish you had more time! 13 miles to the falls and back. Ribbon Falls: (Yosemite Valley) Speaking of getting away from it all...there are people who rock climb all over Yosemite Valley, and they don't see many people at all. This "trail" is a use trail that was created by some of those climbers on their way to climb the Golden Wall--a section of granite just west of El Capitan. The climbers have left a ducked route that you can follow, if you pay a lot of attention, and it goes just about straight up. This is a very steep trail, as these guys don't believe in switchbacks. They just go straight up the side of the canyon, and so will you if you follow this trail! But it's easy to get started. As you drive west past El Capitan, look for road V9 that goes up off to the right. Sometimes you can drive up this--other times it might be closed. Either way, it's not far to the "trailhead." The road switchbacks twice, and just as you complete the second one (near a large woodpile) and head off on a long straight section going West, look for a small cairn on the righthand side of the road. That's it. Rockefeller Grove: (HIghway 120, in Yosemite) This trail starts just across the highway from the trail to Merced Grove. But this one goes north, and leads to some huge Sugar Pines, instead of Sequoias. This trail is easy to walk, but there are very few views, and the trees in the grove are not nearly so impressive as the ones in Tuolumne or Merced Groves. Rubicon Trail: (Lake Tahoe) The premier trail in the Tahoe Basin, this one leads along the edge of the lake from DL Bliss State Park to Emerald Bay. Parking can be a problem because the trailhead is also a great beach access point, so get there early. Then enjoy about 8 miles of beautiful views, an occasional small climb, and lots of other hikers. The trail leads you around beautiful Lake Tahoe, sometimes on cliffs high above the deep blue lake. And it ends up in Emerald Bay, where you can admire the powerboats anchored there. Sardine Falls: (Highway 108) Just about 2.5 miles east of Sonora Pass, this is a fun hike. There is no real trail, nor is there a marked trailhead. But if you are paying attention, all will work out. As you come down the pass, keep your eyes open to the canyon on your right. Soon you will see the falls...and if you stop your car and open the windows, you will hear them roar! Drive down to the meadow, park, and follow the use trails and double track (you'll likely have to wade a couple of times) and you can walk up to the falls. Lovely and fun. These are all in the Tahoe National Forest, and are part of a possible new Wilderness Area: Meiss Meadows. We've heard that Round Lake has some nice cutthroat trout, but we didn't see any. And the only fish we saw in Showers Lake were quite small. Still, this is a beautiful area that is also a great destination later in the year, when some of the high country is getting too darn cold. Meiss Lake, in a swampy meadow, is also worth a visit if you don't mind getting your boots wet. Really wet. 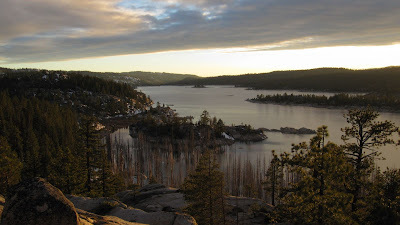 This photo above is Dardanelles Lake. 12 miles in a partial loop. Sierra Buttes Fire Lookout: (Gold Lakes Recreation Area, Highway 89) The great hike here is to the fire lookout on top of the Sierra Buttes. We like doing this one from the East side, and its a tough climb to the top--one of the steepest hikes we know. But we should warn you that when you get to the top, you'll discover there is a 4WD road to a ridge below the crest...and a lot of people just drive up there. At the very top is a series of about 200 steps that hang out over open space to get to the fire lookout. It's a destination you will not forget! Stunning views that can include Mt. Lassen and Shasta on a clear day. Really. That's the fire lookout at right...and yes, those are the stairs hanging over the cliff. Snow Creek Falls: (Yosemite Valley) Do you want a hike out of Yosemite Valley that has almost no people on it, great views, and some exciting destinations at the end? Snow Creek Falls is the perfect trail--if you don't mind a very steep first few miles up out of the Valley. This trail leaves from the end of the Mirror Lake trail, and heads up the side of Tenaya Canyon opposite Half Dome. The views in the first mile are well worth the effort, as within a couple of hundred yards you are well above the trees, and can see up Tenaya Canyon, across to Half Dome and over to Glacier Point. From then on, it just gets higher and better. It does not get easier. But we did it to climb up to Sonora Peak. This is not a technical climb--it's just long and steep. While it may look forbidding, just take your time and slowly work your way up. You will be rewarded with some of the best views between Tahoe and Yosemite! From here the PCT will take you hundreds of miles in either direction. 4 miles rt. Summit Lake to Echo and Twin Lakes loop : (Lassen National Park) This leaves from the Summit Lake Ranger station, and in eight miles tours you through about ten different lakes. There are some dayhikers who do the whole trail, but in general the lakes get pretty quiet after about 3 p.m.
And except for a steep half-mile climb from Echo Lake back out to the trailhead, this doesn't have a lot of up and down. This is one of the great hikes in Lassen. All of this can be done from the same parking lot and trailhead, and if you do both Sentinel Dome and Taft Point, you might get a total of three miles of hiking. That's a pretty good value of views per mile! The photo at right shows the granite cliffs and Yosemite Valley below--and just a tiny part of the railing that might keep your children from falling to their deaths. Tenaya Canyon: (Yosemite Valley) OK--we know. This one is NOT RECOMMENDED by the park staff. This is pretty rugged country, and in the spring, when Tenaya Creek is roaring, it might well be suicide. We've never even tried it then. But in September or October, when most of Tenaya Creek is dry, this is a great adventure. And note that we have always started at the bottom, and turned around when it got too hairy. If you start at the top (Tenaya Lake) that is more complicated--and consequently more dangerous. You need ropes from that end. Really. People have to get rescued here--even rangers! So we started below the canyon, at the bridge above Mirror Lake, where the trail crosses Tenaya Creek. You can see a trail on the left side of the creek as you stand on the bridge, looking upstream. That's because once, a long time ago, there was a trail here. Take the remains of that trail...and stay on the left side of Tenaya Creek, no matter what happens. You will find cairns left by rockclimbers, but not enough to mark the trail well. And you will need to use your hands at times to clamber up some of the steeper spots. But once you get up into the canyon, it really is quite beautiful. This is not a trail. It is not a hike for inexperienced hikers. But the photo above right shows Clouds Rest and the Quarter Domes from the Canyon. Very cool. Terrace, Shadow, and Cliff Lakes (Lassen National Park) --a great shuttle hike from the park road that takes you through wonderful lakes and Paradise meadow. It's all downhill, unless you do it backwards for some silly reason. There are small trout in the streams, but this is really just a hike for stunning scenery. And you just might see a bald eagle. Twin Lakes to Benson Lake and Matterhorn Canyon (Highway 108) is a longer hike--we took seven days to finish the 50 miles. And it leaves from Twin Lakes Road off Highway 395---but the closest pass is Sonora Pass, so we list it here. This one has it all: stunning vistas, wonderful fishing, great lakes, and just a little too much traffic to be on our all time favorite list. But you owe it to yourself once in this life to walk up Matterhorn Canyon towards the Sawtooth Range...seen in the photo below right, or stumble down wide-open Kerrick Canyon, trying to turn your head as you walk to take it all in. And when you add in the wonderful fishing in Smedberg Lake for rainbows, and Matterhorn Canyon for brookies...well, it's a great trip. That's Crown Peak to the left. Remember that the first seven miles up out of Twin Lakes to Peeler or Crown Lake (depending on which direction you take the loop) is a brutal 2500 foot climb. But the next day you are in Kerrick Canyon, wandering amid granite and meadows. And the you go up and over Seavey Pass and down into Benson Lake. That's a steep drop. We think the two toughest climbs are from Crown Lake to Mule Pass, and from Benson Lake to Seavey Pass. Both of those are downhill if you do the loop counterclockwise...which is why most people do it that way. Tuolumne Grove:(Highway 120 in Yosemite) Another way to see some Sequoias is this trail off the Tioga Pass Road just beyond Crane Flat. It's paved the whole way, to reduce erosion, but the trees here are, in our opinon, better and more visible than the ones in Merced Grove. For a real adventure, leave the Hodgdon Meadow campground via bicycle on the old park road. After dropping down to cross the creek this road then slowly and steeply climbs all the way back out to Tuolumne Grove. It's a great ride, but there are a couple of places where you'll have to get off and walk--at least on a road bike. Van Vleck Bunkhouse: (Ice House Road off Highway 50) In 2011, when the snow seemed to last forever, we looked for a hike we could take in late June that was still passable. And with a little help from the Eldorado National Forest Rangers, we found this one. The trail is easy enough to follow, because it's a paved road. But once you get a few miles off the main road, this sideroad is blocked by snow early in the season. That's OK. Just part your car (off the pavement, please!) and start hiking up the road. We followed it well past the wilderness trailhead, and had a great time finding a route up to the east of the road that would give us a view of the Crystal Range. So on the way back, we hiked over to the Van Vleck Bunkhouse itself. It's only half a mile off the road...and within about 400 yards you have stunning views of the Crystal Range--at this time of year, covered with snow. Great hike--but be prepared to slog through snow and runoff early in te summer. That's the view in the photo at right. Velma Lakes: ( Lake Tahoe Highway 89) A tough climb up out of Emerald Bay takes you first to Eagle Lake, then four more miles to Velma Lakes. Early in the season these can be mosquito heaven, but the area is stunning and well worth the climb. P first did this hike when he was about 11 months old, carried on his mother's hip! There are lots of other lakes in the area to explore as well. Like most of the destinations in Desolation, it can be done as a day hike, but then you miss the quiet evening time...and the mosquitos humming around your head. 10 miles, depending on where you turn around. Vernal & Nevada Falls: (Yosemite Valley) Gotta do this hike, even though you will meet everyone in the park. It's the big hike in Yosemite for most people, and you should make sure that at least one way, up or down, you take the innumerable stairs of the Mist Trail. Actually, it is a great hike. It's just that there are so many people on it that it is a little less like a wilderness experience, and a bit more like a very, very, very scenic subway.For best results, start very early in the morning. You'll have the trail pretty much to yourself on the way up, and on the way down you'll be going against traffic. If you look carefully in the photo at left (taken from Glacier Point) you can see both waterfalls.And if you keep going up the Merced Canyon, the trail takes you to the junction to the Half Dome Trail above. Voglesang/Merced Lake Loop: (Highway 120, Tuolumne Meadows, Yosemite) This is one of the classic hikes of Yosemite, and it has everything; high peaks, alpine meadows, stunning lakes, lovely forests, cascades, and lots of people hiking the trail. 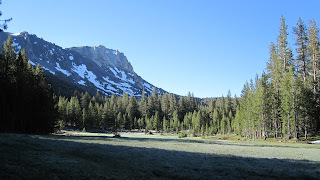 It leaves from Tuolumne Meadows and goes up Rafferty Creek to Tuolumne Pass and then to the Vogesand High Sierra Camp. From there you can continue over Vogelsang Pass, and all the way to Merced Lake and another High Sierra Camp. If you want, keep going to Yosemite Valley, or turn back uphill (our preference) and hike up the granite slabs of Fletcher Creek to Tuolumne Pass again. Or go to Sunrise High Sierra Camp and do Half Dome on the way. Do you want to avoid at least some of the crowds on this trail? Then take the time to hike to some of the lakes off the trail: Bernice, Babcock, Emeric. You will be rewarded with great scenery, some nice fishing in spots, and far fewer people than in those High Sierra Camps. That's photo of Emeric Lake at dawn on the right. Not another group of hikers in sight. From Tuolumne Meadows to Vogelsang is about 7 miles. It's another 8 to Merced Lake. Wawona: (Highway 41, Yosemite's southern entrance) On the southeastern end of the park, this is by far the best place to see giant Sequoias. And while there might also be a lot of people here, there are also enough trails in this area to give you the chance to really feel the forest without the crowds. It's a lovely place in the summer time, but our favorite time to visit is winter. You park at the entrance station, and it's about a two mile hike into the Sequoias. You don't usually need snowshoes (although the park will require chains for your car) because this trail gets enough traffic to tamp down the snow pretty well. But if you have snowshoes, you can really get out an explore this gorgeous forest. And even in the summer, this is magical. Take the time to really explore it and wander through some of the more distant parts of the grove. You won't be disappointed. Click on the photo to see more of Wawona in winter. A top ten hike, for sure. Wheeler Lake: (Highway 4 above Lake Alpine) This trailhead is just a few miles above Lake Alpine from Woodchuck Basin. It leads up through the basin and over the ridge and then down into the Lake. We did this early in the season, and the snow on the northeast side of the ridge was deep and steep. But the views from the ridge are wonderful, including vistas all the way to Emigrant Wilderness and Yosemite. In fact, we'd strongly recommend taking the time to hike out onto the top of the ridge to the East and enjoying the whole view. Wheeler Lake is shallow in parts, and may not have great fishing, but it's still worth the effort. 8 miles rt? Lake Winnemucca and Round Top Lake (Highway 88 at Carson Pass) Another great destination along the Pacific Crest Trail, but these are only a couple of miles in, so they get a TON of traffic. The trailhead at Woods Lake is quite lovely in and of itself, and then you get to climb up the slopes of Round Top Peak to these delightful lakes. Camping is only allowed by reservations, and there are numbered campsites here, just like in a state park. That isn't our idea of the perfect backpacking destination, but a great place for a quick getaway, particularly if you can do it in the middle of the week or on the shoulder seasons. The photo is Round Top Lake in mid-October, after the first snowfall of the season. Only a couple of miles to either of these lakes, but you can also extend this trip to include a visit to Fourth of July Lake, further south, and that would make it 14 miles rt. 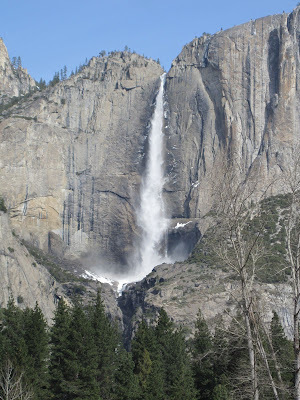 which is just a few hundred yards up to the base of the falls from the Yosemite Loop Road, and there is the more serious version, which leaves from the famous Camp IV campground and climbs up 3000 feet pretty darn quickly to the top of the falls. The latter version is a much better hike, but also requires some real physical exertion. Be sure to wave at all the climbers you see in camp IV--they are the ones you will be photographing later as they hang from the sheer cliffs of El Capitan or other granite faces of Yosemite Valley. And then begin the climb up to the top of the falls. You get a great view of Half Dome about half-way up, and at the top of the falls you can actually continue your hike along the northern rim of the valley, heading either West or East for a really long loop. Those hikes are not for the weak of spirit or underprepared. It's really almost amusing to see the people standing near their cars, 1/2 a mile away, and yet we have the meadow to ourselves. A very relaxing, easy, and enjoyable way to get away from the crowds. No matter when you are in Yosemite, give yourself the pleasures of these meadows. We love to make the effort. From there it crosses Delaney Creek (some nice trout here for those who are interested) and then eventually works it way across a vast shoulder of exposed granite on Ragged Peak. P was once caught in the thunderstorm on this shoulder, and he remembers it to this day! From there the trail wends its way over to Young Lakes--there are three lakes, and the fishing here is fair to good. It's a beautiful spot, the only drawback being that there are almost certainly going to be other backpackers nearby. It's easy to see why this is one of the most popular backpacking destinations in the park! 13 miles rt?